Acorn Glass work closely with designers and architects in the use of glass for internal partitioning, in both commercial buildings and domestic dwellings as they are hygienic, wipe clean and are available as seamless or framed. We use toughened and laminated glass, of varying thicknesses, in our partitions to give a wide extending scope in their projects. Coloured glass for use in wall cladding internally to entrances and foyers, corridors, offices washrooms, leisure centres, restaurants and kitchens is another popular choice that Acorn Glass provide to our customers. Our internal glass partitions have proved to be popular and beneficial choices as they not only allow natural light in and around the building, but also help to reduce noise transfer between areas, provide the option for privacy by use of opaque glass or integrated blinds, can be fire and impact resistant and are available in a wide choice of colours to compliment and blend in with the surrounding environment. A wide range of colour choices is available and patterns and logos can be incorporated within the design. At Acorn Glass we provide bespoke reception counters and screens and/or screens that fulfil your requirements and let you reflect your business and make your visitors feel welcome. Our reception counters and screens can be glass only or mixed with stainless steel or timber, or all three, and can incorporate patterns, logos and cut outs for cable runs, lights or document transfer. They are also available in a wide range of colours, textures and patterns. Our technical team will always be available to assist, and work closely with you, in any design requirements and provide you with their recommendations. 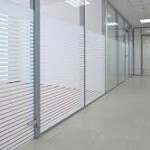 Glass partitions provide a clean, smart and modern feel with a flat finish that can be easily maintained and can be used to cover entire walls, part of a wall or as a feature amidst adjoining finishes. With the cutting machinery we have available at our Newport factory we are able to accomodate any shape required including the provision of cut outs within the panels for sockets or pipes and the glass panels we supply and install can be applied to vertical or sloping surfaces.